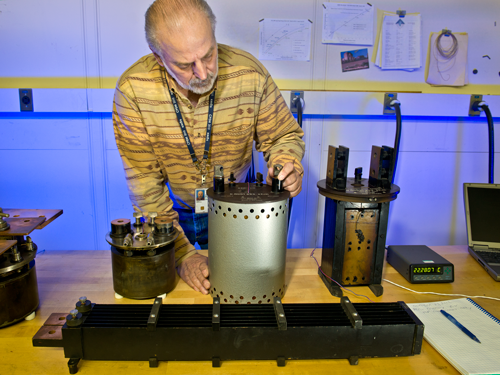 Marlin Kraft of PML's Quantum Measurement Division adjusts connections on a current shunt resistor that dates from 1899. At left is NIST's Direct Current 3000 Ampere Measurement System. Each of its three power supplies puts out a maximum of 1000 A. The electrical power industry – and the equipment makers and calibration laboratories that serve it – need to be able to quantify DC currents of hundreds or thousands of amperes with high precision. Such measurements, among others, are essential to the evolution of the "Smart Grid," a planned nationwide --and eventually global -- power network that uses information technology to deliver electricity efficiently, reliably, and securely. The standards are increasingly stringent. But because the nature of electricity doesn't change over time, even the most sophisticated 21st century current measurements are based on the famous law postulated in 1827 by German physicist Georg Ohm: I = V/R. That is, if the voltage and resistance are known, a straightforward calculation yields the current. "We've had people say to us, 'Hey, how hard can it be? It's just Ohm's Law!' " says Marlin Kraft of PML's Fundamental Electrical Measurements Group, which calibrates current-measurement equipment among other responsibilities. "Well, I've been doing this kind of work for almost 35 years. And can tell you that when you're dealing with nanoohms, it gets hard real fast." That's why Kraft's expertise is in high demand with commercial and government customers, as well as other national metrology institutes (NMIs). It's also why he was recently asked to troubleshoot measurement problems for a major instrument manufacturer. In high current-test circuits, voltage can be controlled with very low uncertainty. Thus the critical system component is a shunt resistor, typically rated from 100 milliohms (mΩ) to 100 microohms (µΩ) or even lower. Kraft and colleagues provide calibration services for such shunts whose resistance should be accurate to within a fraction of 1 percent, along with numerous other resistance calibration services that together earn NIST several hundred thousand dollars per year. Kraft demonstrates a variety of shunt types. At rear are canister models designed for suspension in an oil bath. At front is a more recent, parallel-element design for operation in ambient air. For calibrating resistors, Ohm's Law is again applied, with resistance as the unknown variable. The current shunt under test is connected between the terminals of a copper bus through which flows a specific, stable current (PML's automated lab unit goes up to 3000 A) at a small, carefully controlled voltage. The resistance is measured by the voltage drop across the shunt and those values are compared to the NIST standard unit. 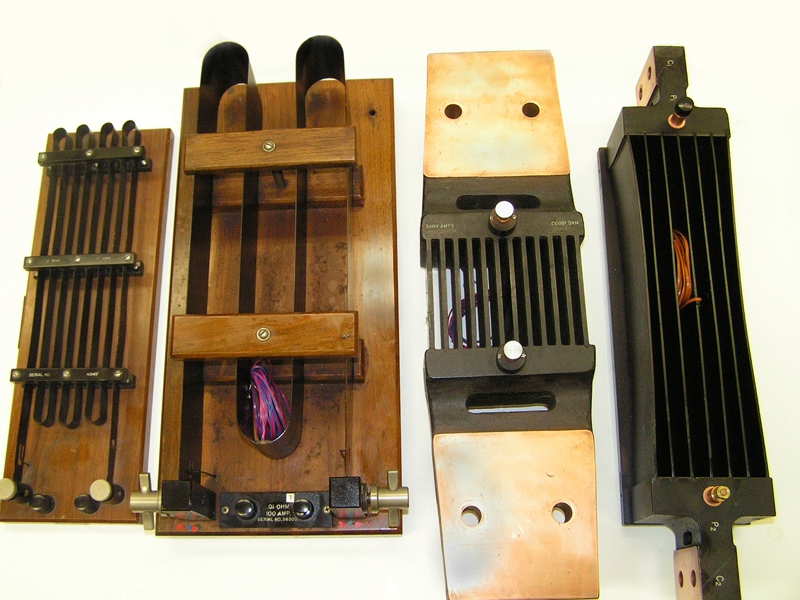 Shunts are tested repeatedly with various combinations of current and voltage. Not surprisingly, there are numerous factors that can affect measured resistance, notably including self-heating. Power dissipation around 100 watts is not unusual, producing temperatures that can exceed 70 °C. That problem prompted Kraft several years ago to introduce a new technique that is now standard practice. "In the old days, they never used temperature-versus-resistance relationships. Instead, they would turn on the current and just let the shunt stabilize at some equilibrium temperature. That could take a long time," Kraft says. "I developed a process in which you attach a thermocouple to the shunt. That way you can plot resistance and temperature and come up with a curve. Once you establish that curve, you don't have to wait for some equilibrium point. You can just find your temperature and go from there. That practice has really helped the customers, because they don't have to wait as long." To minimize temperature effects, most low-ohm shunt resistors are made of a copper alloy first developed in 1892. Called manganin, it contains about 12 percent manganese and 2 percent nickel, and has a very stable resistance across a range of temperatures. Some manganin shunts have extraordinary working lifetimes. One 100 milliohm unit that Kraft uses was built in Germany in 1899. Its drift since then has been around 0.01 percent. "This is a lost art," Kraft says. "You can't buy shunts like this anymore." You can, however, buy resistance-calibration systems. One such, with a 2000 A capacity and a similar configuration to the system in Kraft's lab in Gaithersburg, MD, was acquired in 2012 by Keithley Instruments of Cleveland, OH. "Before very long, they were having problems getting it to work," Kraft says, "and even when they could, they were questioning the values they were getting." So Keithley's Service and Metrology Manager, Helga Alexander, asked if Kraft could come to Cleveland, evaluate the situation, and work with company technicians to eliminate the problems. He arrived in mid-January, 2013. At left: Two current shunts of the "ribbon" design. At right: Two shunts of "parallel-element" design. "Right away," Kraft says, "we found out that the connections were a big problem." Kraft had previously shown in presentations to the National Conference of Standards Laboratories International meetings and elsewhere that the condition and placement of current connections to the shunt can have substantial effects. For example, placing current connectors on the same side, or on opposite sides, of the shunt end plates makes a difference of about 100 µΩ/Ω in measured values. The contact geometry and even the tightness of the bolts have appreciable (and reproducible) effects. With the Keithley technicians, Kraft worked through many possible sources of error, and "by the last day, we were making measurements within 20 µΩ/Ω" of the NIST standard, he says. 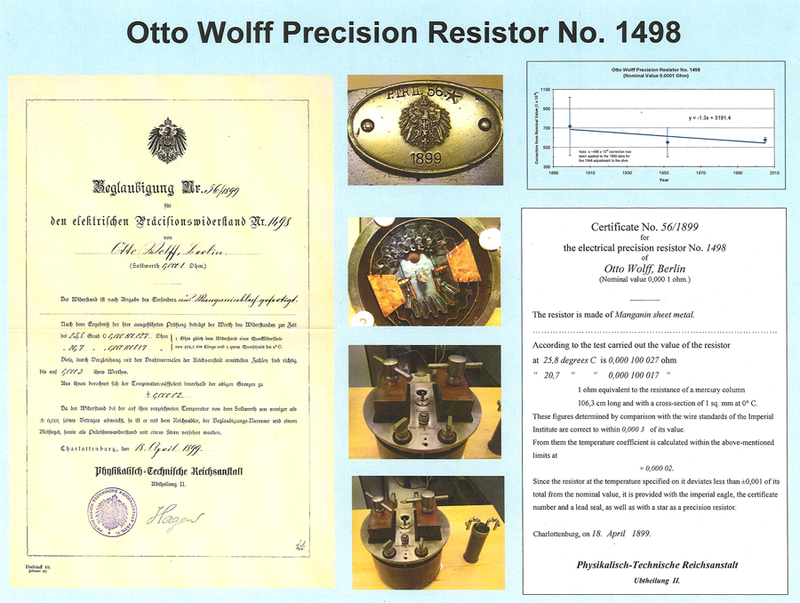 In another recent collaboration, Kraft compared NIST's low-resistance reference resistors against those of VSL, the Dutch counterpart of NIST. The study found excellent agreement, with measurement uncertainties at 100 microohms between 0.54 µΩ/Ω and 4.3 µΩ/Ω. "There has never been a low-ohm comparison of this sort anywhere," Kraft says. "Now we're being approached by another country, and I expect we'll see even more." Indeed, increased close cooperation is inevitable as facilities across entire continents must work together to develop and modernize electrical distribution through smart-grid networks. "Developing interoperable standards that enable diverse systems – including solar, wind, and other renewable sources from a variety of sources – and their components to perform in unison and communicate seamlessly will require a new framework of interfaces, protocols, and other consensus standards," says Jon Pratt, Leader of the Fundamental Electrical Measurements Group. "And that effort, in turn, demands precision metrology and high-accuracy calibration."